This spectacular selfie was above was snapped outside the ISS by Japanese astronaut Akihiko Hoshide. A wrist-mounted mirror may sound preposterously lo-fi, but sometimes the most simple ideas are the most effective. 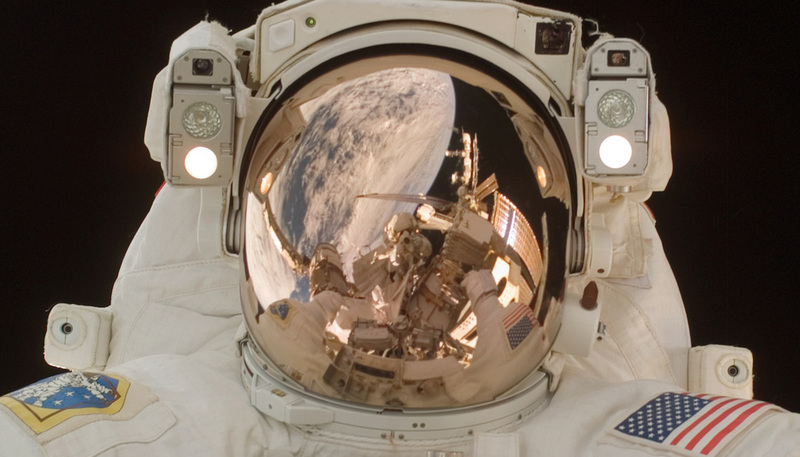 When outside of the ISS, astronauts wear a mirror on the sleeve of their spacesuits in order to see readings on their chest-mounted control unit. The markings are all written backwards so that their reflection is readable. They also wear a simple checklist cuff with a list of tasks that need carrying out on each spacewalk. Winner of the Best Mission Concept award in Nasa’s International Space apps challenge, this internet-connected spacesuit has been designed to be worn by astronauts working on the ISS, in particular, British astro Tim Peake. Designed for comfort and practicality, the suit uses 3D printed elements and includes social networking integration to make it even easier to tweet from space plus a vision board on the sleeve that displays live weather updates from Earth to make the wearer feel at home. There’s also a 3D printer in the pocket, and the suit is hand-sewn using conductive thread that carries power and data to the embedded devices. Awarded the People’s Choice award in the same competition, the simply named Space Helmet from Space Apps Valencia is an update to the existing piece of astronaut kit and includes a smartphone screen integrated into the helmet to display vital stats such as oxygen levels and heart rate. A virtual reality glove can be used to point to any star and receive more information about it on the screen while a 360-degree camera will record what’s going on. The idea is that this footage could then be viewed on Oculus Rift for an immersive space-flavoured experience. Another entry in Nasa’s space wearable competition, this 3D-printed wearable is based on the Pip-Boy 3000 from video game Fallout 3 (and Fallout: New Vegas). The wrist-mounted device is designed to work with an iPhone over Bluetooth to display critical environmental readings such as atmospheric pressure, temperature and radiation. The unit includes a built-in Geiger counter and was designed to hold a heart rate monitor but the team ran out of time to include the latter. Hopefully Nasa would have a bit more time if it ever chose to make something similar. It might not grant the wearer Ironman-like powers but Nasa hopes that the X1 Robotic Exoskeleton will one day keep astronauts healthier and even assist paraplegics with walking here on Earth. Sporting four powered joints as the hips and knees, plus several passive joints for extra flexibility, the device is worn over the legs with a harness that reaches up the back and over the shoulders. It can be used in ‘inhibit’mode for exercise, or the opposite to give the astronaut a boost on tricky terrain.